Manage and connect dependencies across multiple projects by “coding” Inputs/Outputs (or Givers/Receivers) using SSI Multi-Project Tools. SSI Tools helps you decompose a large complex project into separate subprojects without losing dependencies that link one project’s outputs to another project’s inputs. Inputs/Outputs (or Givers/Receivers) can be explicitly “coded” using SSI Tools and reconnected automatically. SSI Multi-Project Tools are useful for identifying dependencies between IMS sections and synchronizing local and remote projects. Ability to separate one very large project into various sub projects. 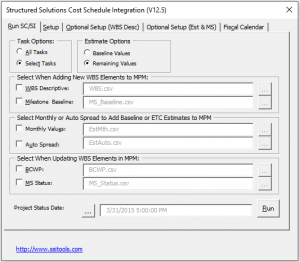 Ability to combine two or more project files (subprojects) into an Integrated Master Schedule (IMS). 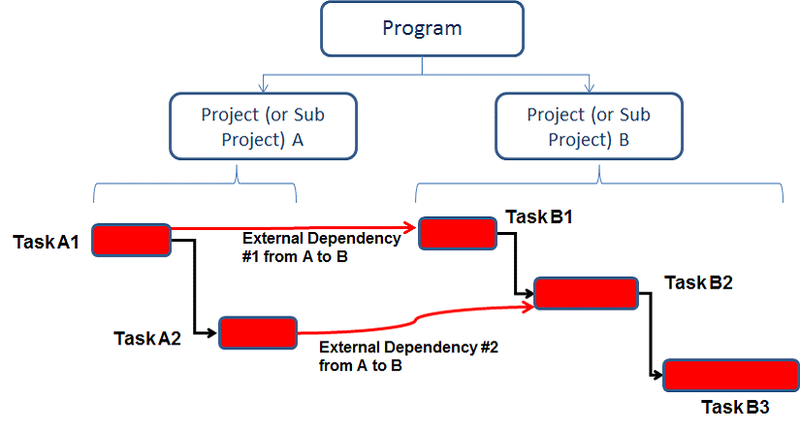 Ability to identify dependencies between different projects. Ability to manage shared resources and cross project dependencies. What is an Integrated Master Schedule (IMS)? A collection of subordinate schedules (subprojects) that are defined by the hierarchy of a Work Breakdown Structure (WBS), Organizational Breakdown Structure (OBS), Integrated Product Team (IPT) Structure, or some other logical structure such as Project Life Cycle, Functional, Financial or Customer Defined. The benefits of using an IMS include the ability to perform a Critical Path Method (CPM) analysis across multiple Work Breakdown Structures and the ability to increase the scope of shared resource management. A hierarchical decomposition of the Integrated Master Schedule. At times, a subproject can stand alone to allow simultaneous maintenance and updates. 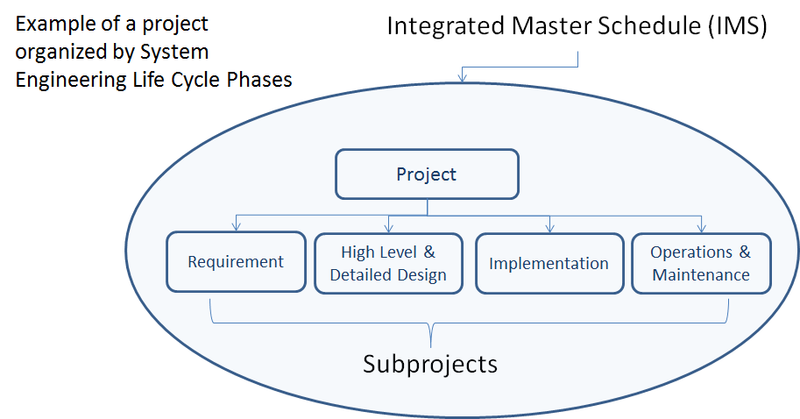 Other times subprojects can be inserted into a master plan to facilitate the type of analysis and project perspective described in the IMS section above. Click this button to clear all sorting, filters, and groups and expand all levels of the Work Breakdown Structure. Ensure valid status of tasks with SSI’s Post Task Status form. Invalid dates (projected dates before or actual dates after the current project status date) are shown in yellow to remind you to address their status. Change remaining resource assignment values while keeping dates as they are. 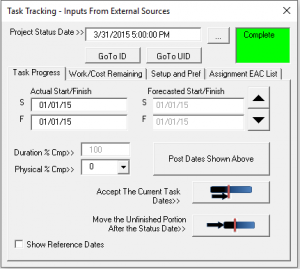 No need to constantly change task type from Fixed Duration/Work/Units while estimating remaining resource values for in-progress tasks. 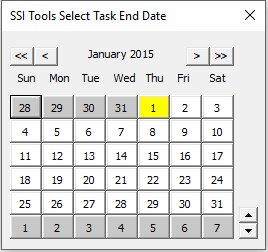 Pick a date from a simple calendar pop-up and have SSI Tools calculate how much to increase or decrease a task’s duration to reach that date – without adding date constraints. 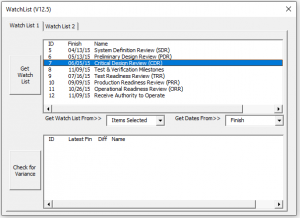 The SSI Watchlist is useful for tracking variances on key items in one section of a schedule as you are working in another section of a schedule. Each time you make a change in the schedule that has the potential to cause a variance to the key milestones, you can click Check for Variances to see if any of your changes has caused a schedule variance relative to the dates you are tracking. 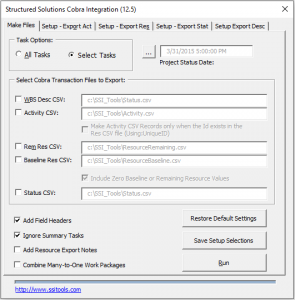 SSI Tools includes two "bridge" tools to generate import files (transaction files) for schedule integration with Deltek MPM™ or Deltek Cobra™ - two popular Earned Value Management tools. SSI’s EVM bridge tools solve the problem of “fiscal period” reporting by letting you define your own reporting calendar rather than using standard calendar weeks or months.  SSI Tools is packaged with an example project that you can use as a playground to try out and learn all of your SSI Tools. 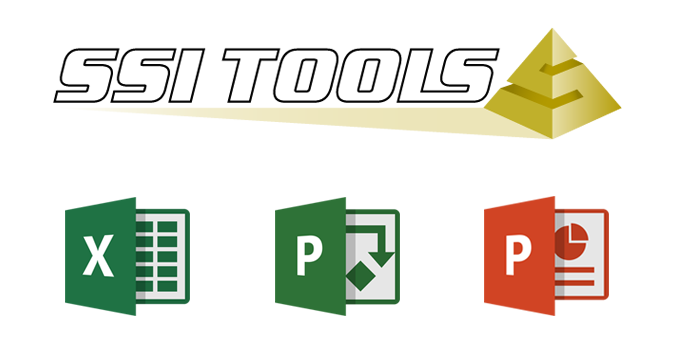 Check to make sure you are always on the latest version of SSI Tools by checking for updates. Set update preferences, and be notified of new updates automatically.